#SundaySupper is doing 5 Ingredients of Less today and we make Chicken with Olives!! These are easy meals with little mess. We are allowed water, salt, pepper, and oil as “freebies” and they do not count as ingredients. Okay, go!! My brain started whirling with yummy ingredients and I stopped on chicken and olives for some reason. Delicious crispy chicken with the addition of slightly salty black olives. This dish was super easy and so delicious. Ken raved about the olives and parsley with the chicken and loved it!! Crispy on the outside and juicy on the inside. This makes a perfect weekday meal or #SundaySupper without the fuss. The chicken roasts on the outside and poaches in the delightful garlic butter that seeps into the bottom, DELISH!! Chicken with Olives is a simple and satisfying meal for any day of the week!! Preheat oven to 400F. Mix the butter and garlic together. Place a small amount of butter under the skin of each thigh and rub onto the chicken, rubbing extra on the top. Salt and pepper the chicken to taste. Place in a small to medium casserole dish, just big enough to fit the chicken. Roast in the oven for 30-40 min. until done. Baste and broil to brown if necessary. Serve with olives and parsley sprinkled on top. Look at the lineup this week, try many of these delicious recipes to help you in your busy lives. Candied Apple Jelly from What Smells So Good? 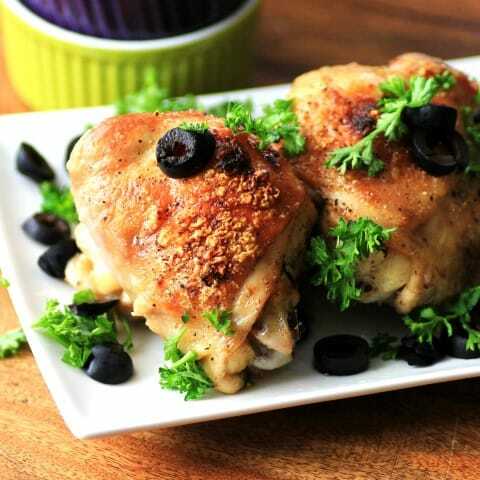 What a great idea to serve this chicken with olives and parsley! I am sure it tasted delicious! Quick question: If I used white meat / chicken breasts, what do you think the cooking time might be? Depending on the size of the breast I think they would take the same amount of time. You could cut each breast in half so they aren’t such a large serving and they would be the same size as a chicken thigh. Always check with a good thermometer for doneness. Thanks so much Kim. Tara-the chicken looks so perfect! Crisp on the outside and juicy on the inside…and perfectly paired with olives. Lovely! It was yummy chicken that was for sure, thanks Marjory!! I do something similar with lemon and olives but I love the idea of using parsley. That would be great too Laura with the lemon, couldn’t get another ingredient in though. Loved the parsley with them!! Sometimes I forget how delicious the simple things are. Thanks for making easy look so good! Your chicken with the nice boost of garlic and butter flavors sounds amazing!!! I LOVE this dish, Tara! I think your brain stopped on exactly the right combination – so darn delicious, my mouth is watering! Thanks so much Heather, not quite sure how that brain works sometimes!! That crispy skin is the best, Tara! I’d like to reach right in and help myself. I would love to share dinner with you Stacy, come on over!! Chicken and olives make a great combination. One of my favorite dishes is Chicken Marengo with tomatoes, onions, and black olives. Thanks so much for coming over!! 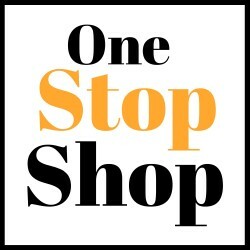 We love olives, they make a great addition to a recipe. This recipes is so EASY! and sounds delicious. Grampy is going to love this. Thanks so much Joanne, I hope Gramps enjoys this!! Yum. I can see the crispiness in the photo and I love a crispy chicken. I love the idea of black olives as typically green one are used in recipes like this. way to change it up. Yes, green olives would be so good too!! Thanks Marlene! They look beautiful Tara..what a great dish! Chicken thighs are a staple in our house! So much more flavor than the chicken breast. Love the flavor combo of chicken and olives! I much prefer chicken thighs for cooking whole chicken pieces, they have so much more flavor!! Thanks so much Amy!! The chicken with olives looks delicious and easy! Love it! Thanks so much for coming over Serena!! Looks like a tasty combo! I would like to fix chicken thighs more and will keep this in mind for when I do. Great photos too! Thanks so much David, happy to have you cooking with us on #SundaySupper!! love that you used chicken thighs . . the best and so flavorful, yumm!! Thanks so much Alice and for hosting!! My coconut pie recipe is back on the blog. Thanks for pointing out its absence…a casualty from upgrading WP and having no editing ability while ZipList was installed! Glad that was fixed! I will pop over again, I thought it was me but I looked and looked and couldn’t find it!! Tara, I love your recipes! This looks so good and looks like you slaved over it for hours! It hard to believe it under 5 ingredients. Great job! Thank you so much Deanna!!! Tara, I HAD to comment on your delectable dish. The photo captured my attention immediately; the 5 ingredients aspect (and list of so many others!) made me bookmark it right now. Thank you. Looks & sounds wonderful! Thank you so much Kim, I loved that you came over, enjoy!! I have never been a fab of olives, but this looks like a recipe I will have to try! I can understand why Ken was raving. The chicken and olives are fab but the garlic butter you place under the skin is BRILLIANT! Those chicken thighs look gorgeous! That crispy skin and I’ll eat basically anything with olives. Thank you so much Susan, I am an olive girl big time!! Well this dish will work for you both, as he can have it without and you can have it with!! Thanks so much for coming over Katie!! This looks so good. 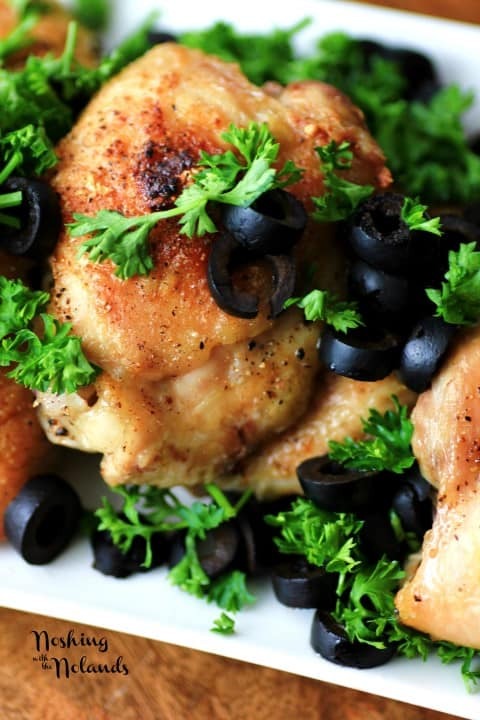 I love black olives and I bet they taste great with this chicken dish! Wonderful how easy this is to make. It would be a great quick dinner for a busy night. With olives and chicken, my mom will be in on this for sure! I have to agree Dorothy!! Thanks Jane, I hope you enjoy it!! I’m always on the lookout for new chicken recipes as Sous Chef could eat chicken every night. This looks and sounds fabulous! Thanks so much Christy and it is so easy too!! I love chicken thighs. thanks for a different recipe, Tara! Grabbing this to share!! Looks amazing and easy!! YUM!! Thank you so much Evelyn!! This looks fabulous Tara. The browned skin and all those tasty olives? Perfect!! This reminds me of a chicken dish my aunt makes with olives and stewed prunes. Beautiful dish! I would love to try your aunt’s dish too!! Sweet and salt, mmmmm!! Crispy on the outside is how I love my chicken! Your chicken with olives is beautiful. I’ve never had chicken and olives together but I would really like to give it a try. Thanks so much Dionne, I hope you try it!! Lovely dish Tara, just lovely.